Why should you use a leather repair kit? What should you know about leather repair kits? Any leather product will require that a level of maintenance be performed upon it from time to time. Typically, leather will need to have leather cleaner and conditioner applied, undergo a level of leather restoration, and perhaps gluing and stitching on the leather, depending on the craftsmanship. Using the best leather repair kit allows the owner to perform simple restoration to the leather, avoiding excessive costs, moving large furniture, as well as provides a sense of satisfaction in knowing that you have accomplished something. Using a leather repair kit is not difficult, but it does require time and attention to details. When repairing tears, you may need to provide additional contents (such as patches and patch glue) before using the product for best results. Tweezers, leather needles, and specialty tools are available at craft suppliers and online distributors, should you wish to obtain a professional look and not just a “patch” job. Remember, you typically get what you pay for. While there is a great deal of leather repair kits on the market, ranging in their prices and their contents, not every kit is beneficial for your leather. Some contain glues which are no better than school glue, others contain dyes which are 80% or more water. Take the time and find kits which offer quality dyes and glues. When using dye based leather restoration/repair kits, it is critical that you test the area on a scrap piece of leather prior to doing any major application. This will minimize the risk of getting blotches and unsightly results due to a mismatching in color or a chemical reaction. If you do not have any scrap leather, perform the test on the underside leather (meaning you flip the couch upside down) of the furniture, as it is quite unlikely that you will have people peeping up from the floor to see the quality of the sofa or seat. Coats should test the leather on the interior base of the jacket. Not every leather repair kit is intended to be used universally, meaning that a kit may be suitable for cowhide leather but would ruin suede or nubuck leather. Check the instructions and intent of the kit you wish to purchase. That being stated, also ensure that the leather that you are fixing does not have special sealants and coatings which would prevent you from using the product effectively. If you have any questions about a product, it is best to contact the distributor directly or to seek the professional advice from your local leather artisan. Try to soak up the stain or additive substance from the surface. Make sure that the surface in which you are applying the fixes is dry before you perform any repairs. Additionally, fully read all the instructions as well as watch any supporting videos provided by the product maker to get the best results when using a leather repair kit. Damage to leather which is light, such as fading, scuffs on the leather, or discoloration tends to be a subtractive problem. This means that the leather dyes (in most cases) have been removed from the surface. Typically, the problem arises from the leather being stored in direct sunlight, from contact with an abrasive surface, or from a chemical reaction from an outside solvent. In all instances, it is best to clean the surface, let the leather dry, and then use your repair kit to bring the leather back to life. Keep in mind that DIY leather kits are intended for minimal repairs and fixes. Tears should not extend beyond one to three inches in length. Anything over that should be fixed by a local leather artisan or an upholstery professional. Discoloration, whether additive or subtractive, which covers more than 10% of the surface area, may require a total re-dye of the leather to ensure consistency and a fluid look to the leather. 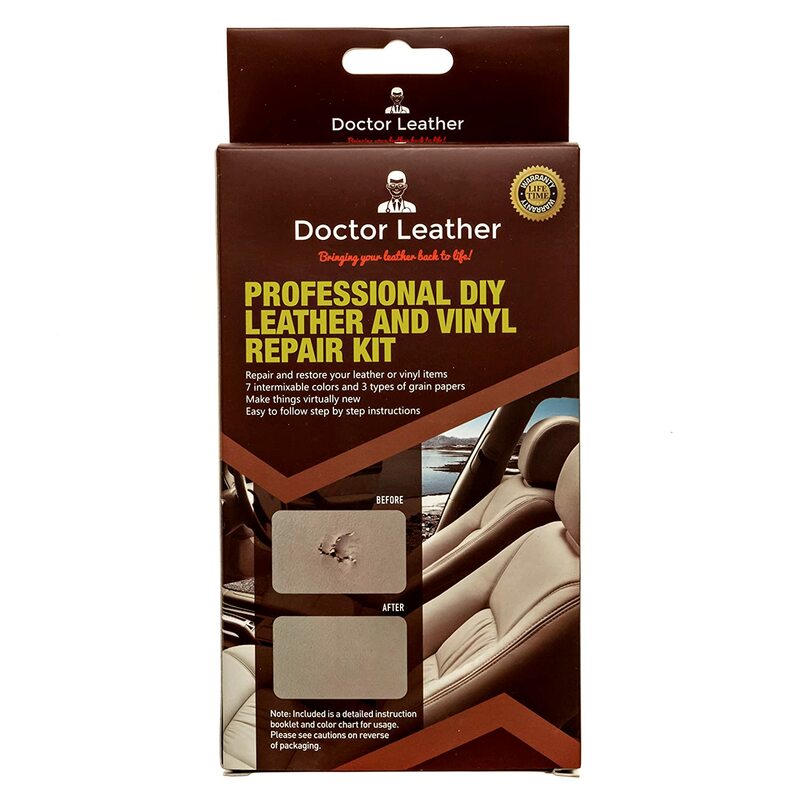 ​Leather repair kits are intended for minimal to medium size repairs. They are also intended, primarily, for genuine leather products. Synthetic leathers may not adhere or dye as expected due to the fact that they are manufactured and unpredictable in their makeup/textures. ​Here are our top 5 picks for best leather repair kit options. These kits were chosen due to their ease of use, their customer reviews, and pricing. Please note that it is always the best practice to visit the manufacturer’s website to address any questions or concerns you may have with the product. 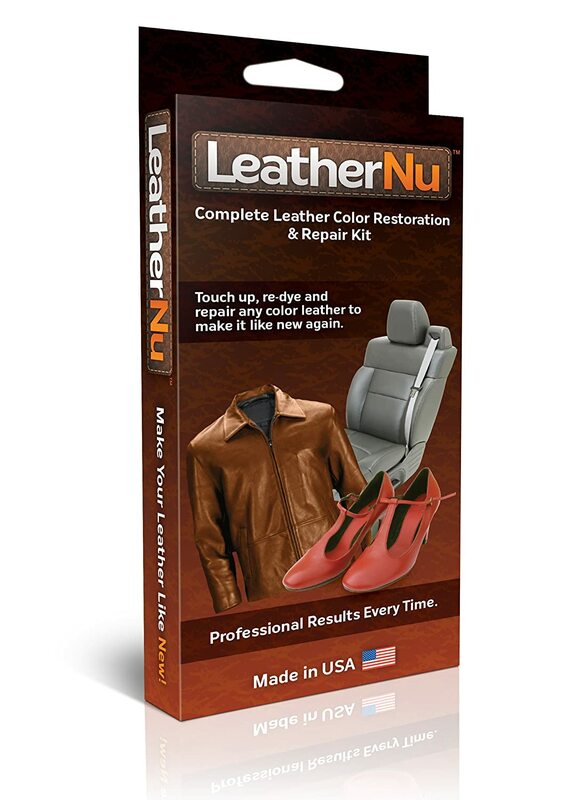 The LeatherNU Complete Leather Color Restoration & Repair Kit is intended for additive color repair. Included in the kit are 7 mixable dyes which, theoretically, provide you with the means of matching any existing leather color for a quick fix. The glue compound dries clear and holds seams well. Several texture leather papers are provided which allow for not only color matching but material blending on the repair. There are several dyes which are provided which maximize the ability to get the right color for the restoration. Enough materials are provided in the LeatherNu Complete Leather Color and Restoration kit to perform rather large repairs on leather furniture. Dye treatment requires several applications, making the quick fix advertised rather lengthy in some instances. No mix containers or chart is provided, so while you may have 7 colors, if you do not know the exact formula, you could be mixing and remixing to get the right combination. The Doctor Leather repair kit is deemed by others as a complete kit with a lot of options and variety. It is basically a comprehensive kit that is made to provide pro users with ultimate satisfaction. It is not only for repairs but it is able to revamp the leather material and product as well. It can also repair and restore scratches and make it look brand new. It boasts of being professionally made, but easy to follow. Also, the makers provide an online help that buyers and users could use to voice out their queries and concern. 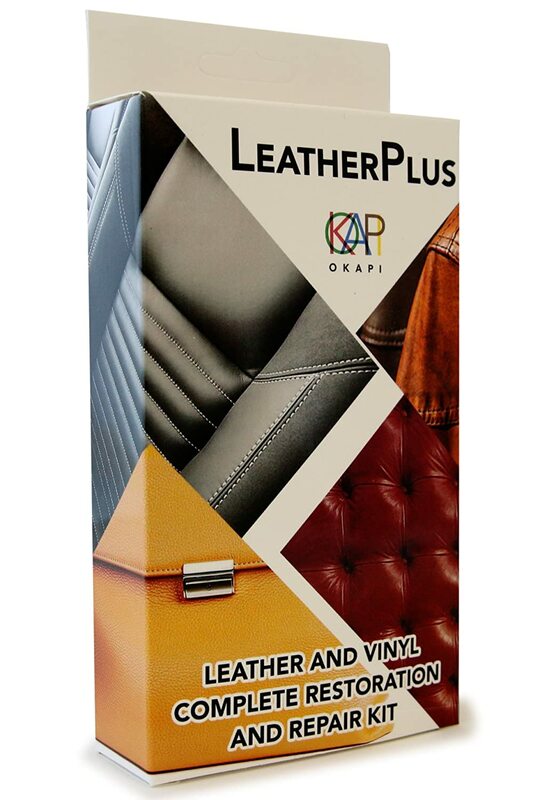 LeatherPlus repair kit advertises that it is a leather and vinyl repair and restoration kit for couches, car seats, sofas, jackets, purses, and boots. The application is intended to be fast drying with a no heat adhesive. The kit comes with a matching guide. This greatly minimizes the guess work in dye combinations. The product has a video link which provides a visual instruction for the best use. When combined with the detailed instructions, customers found the results to be spot on with their expectations. Customers have stated that the owner of the company has addressed concerns and provided individualized suggestions for solutions using his product. The kit seems to work best with punctures under an inch which is rather limiting. Dyes tend not to dry evenly resulting in weird discolorations when applied to surfaces over 1 inch in diameter. Compound dries tacky requiring sanding which tends to reopen tears and punctures. 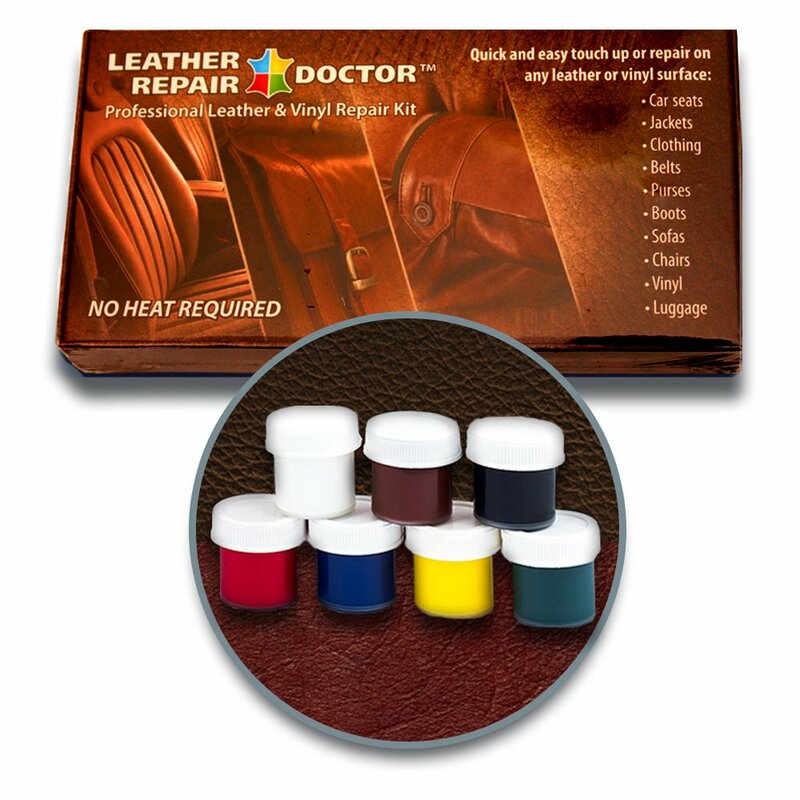 This 2-in-one (no mixing required) professional leather restoration & repair kit claims to allow you to match any color with no heat. As heat applicators tend to damage leathers, this is an incentive towards the Leather Repair Doctor kit. Liquid leather application is pliable. This allows for the damaged area not to receive progressive damage over time but rather flex and move as leather is intended to do. Using the kit for discoloration repairs requires many layers. Most customers said more than 3 to 4 coats were needed. The dyes are extensive but the black is limited. As most leathers have some hue of black this greatly reduces the “endless” hues advertised. 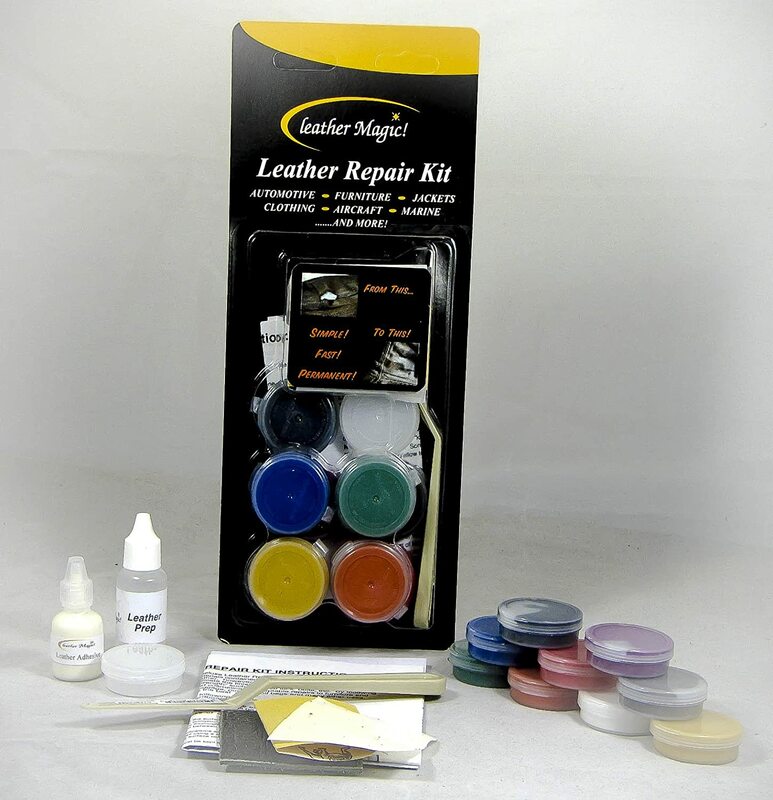 At first glance, you will see that the Leather Magic Leather Repair kit is not intended for large repairs. It is an additive repair kit for the smaller problematic areas of leather furniture repair. There are no harsh chemical used and no heat, and the process is simple. However, for surfaces which require more than just a touch-up, it is recommended that another option be chosen. Repairs from the product have been reported to last for six years or more. Obviously, the glue compound is strong enough for the longevity of the product it is being applied to. Detailed color mixing instructions are included minimizing the guess work. The kit comes with sandpaper as well as backing material allowing for seamless repairs. Bond and patching instructions are clear, but there is also a product video on youtube for further clarification. The adhesive it a bit messy to work with and customers complained that they had to work with the compound before getting it to set properly. ​The best leather repair kit is only as good as the instructions and the dyes which it contains. Proper attention should be given to the mixing and application process. Keep in mind that when you repair leather, it is quite uncommon to get a perfect finish. Just as a scar on the skin can be faded to reduce it being seen on human skin, so does the leather repair kit minimize the area of damage. In cases where there is severe damage, peeling, tears, and such to the furniture, coat, belt, purse, etc. it is advised that you have a professional inspect the leather and give you options best suited for the fix.